Many religious groups, including the Knights Templars, were situated to the West of the London City Walls. The Knights Templars moved from their original premises in Holborn and bought a considerable amount of land on which they constructed their Round Church and other buildings. This land is where Middle Temple is now situated. In 1312 the order of the Knights Templars was suppressed but their place was taken by the knights of the "Order of the Hospital of St. John of Jerusalem". These Knights devoted themselves to caring for pilgrims and set up a hospital which gave rise to their common name the "Hospitallers". The Hospitallers leased many of their buildings to London lawyers which were used as hostels, or Inns, by Barristers and Law Students and as time passed so began the Inns of Court and Chancery (a chancellor's court, or office or building, in which it is located). This group of buildings evolved into the equivalent of a University which taught the Arts, Theology and Medicine as well as the Law. The Middle Temple Hall was built between 1562 and 1573. Middle Temple is now known as one of the four Inns of Court School of Law . English Barristers are still required to join one of the four Inns (Gray's Inn, Middle Temple Inn, Lower Temple Inn and Lincoln's Inn) to qualify as a barrister. Middle Temple Hall is open to the public. The Hall measures 100 feet in length it has an 60 foot high oak double beam roof and a carved wooden screen. Middle Temple dates back to 1573, Gray's Inn to 1556 and the Old Hall, at Lincoln's Inn, dates back to 1490. 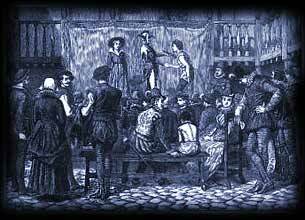 It is not now generally known as a theatre but during the 15th and 16th centuries was used for a venue for lavish entertainment. But the history and evolution of the site explains the connection. Festival times celebrating Christmas and Candlemass were especially important and Middle Temple became famous for hosting various forms of entertainment including dancing, masques, revels and of course the staging of plays. In February 2002 a male acting troupe from the New Globe performed Twelfth Night 400 years after it had originally been acted at the Hall. In 1602 William Shakespeare's acting troupe, the Chamberlain's Men, were invited to perform at the Middle Temple Hall. They gave the first recorded performance of Shakespeare's Twelfth Night and it is believed that William Shakespeare was included in the cast. The history of Theatres that were prominent during the life of Shakespeare is fascinating and we have provided the London Map detailing Theatres that Shakespeare would have most certainly known and visited and quite probably have acted in. We have researched the history and locations of many of these theatres and plotted their locations into a modern Map of London. The names of many of these theatres still live on in London as they are reflected in the names of many current London Roads. Although we are born in bred in London we were not aware of this. We found the ' Middle Temple' on the modern Map of London, what's more it is still in use as Seat of Law and Barristers are still required to join one of the four Inns (Gray's Inn, Middle Temple Inn, Lower Temple Inn and Lincoln's Inn). These links with the past and Shakespeare's London are endless.